This is "Custom/Manual" page in EurekaLog project's options. This page allows you to manually edit, add or remove any EurekaLog project option. You can use this page to add new options to your project. Warning: be extra careful when editing options manually. Options will be used "as is". See EurekaLog options for more details about rules of encoding options. Please note that [Exception Log] header should not be present on this page. • Options are sorted for your convenience, but new options can be entered and placed in any order. There is no need to preserve sort order. • Options with names started with "_" will not be saved into executable. Those are design-time only options, they are saved in project options, but not injected into final executable. Examples of such options are _BugAppVersion, _BugID, etc. • We suggest to use "Custom_" prefix for your own keys. EurekaLog will never have any option name, starting with "Custom_". Thus, your names will not collide with EurekaLog settings. 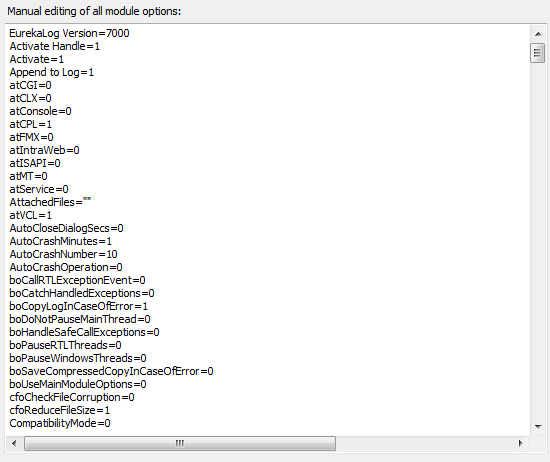 • You can retrieve any option at run-time via CurrentEurekaModuleOptions.CustomField['Option-Name'].